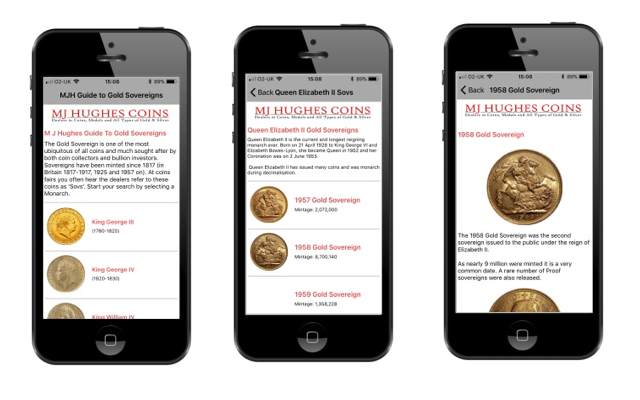 A new iPhone App For Gold Sovereigns, MJH Guide To Gold Sovereigns, has been launched by M J Hughes Coins. The free iPhone App is a listing of Gold Sovereign coins with history, mintage information and other associated facts and data. Many with images of obverse/reverse. The iPhone App For Gold Sovereigns is easy to use. It starts with a list of all the Monarchs who issued gold sovereigns. With a single click this takes you to a list of every sovereign (including proofs and overseas mints) issued each year, and you can see the mintage figures in that list too. Click on the coin and another screen with greater details appear. Descriptions, history, facts. monarch details, mint details, specifications. Some have a sort of what happened in this year entry, which can be quite interesting. There are images of Obverse and/or Reverse for many of them. There are more than 348 sovereign entries and over 100 have images. The list contains almost all modern gold sovereigns from 1817 to 2017 (unc and proof) and includes all the mints – London, Australia (Melbourne, Sydney, Perth), Canada (Ottawa), India (Bombay, now Mumbai) and South Africa (Pretoria). A Wish List is included so that you can conveniently and quickly view your wants when at a coin fair even if there is no Internet connection. The Wish List is stored on your phone and is also a quick way to list your favourite coins. 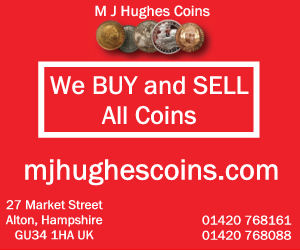 M J Hughes Coins was established in 2006 by Max Hughes, and have been a member of the British Numismatist Trade Association (BNTA) since 2009. Max Hughes is a leading UK Gold Sovereign expert, but also deals in all modern gold and silver coins. 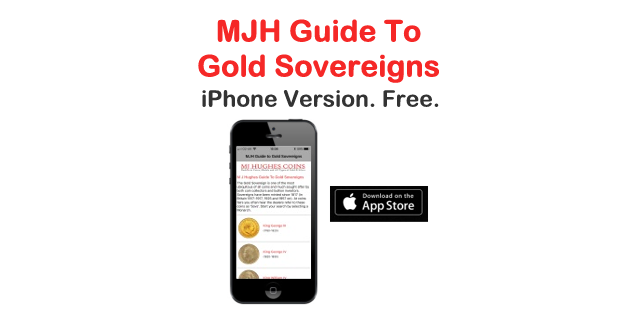 You can download the MJH Guide To Gold Sovereigns app from the Apple App Store. 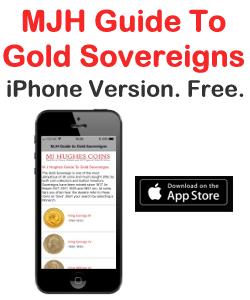 Use that link or open the AppStore on your iPhone and search for “gold sovereigns” or “Max Hughes”.